NowUSeeIt Player – How to Uninstall? NowUSeeIt Player is advertised as an application that can allow you to watch online videos without having to open your browser. The ability to play videos straight from your desktop may be a useful feature, but the program has serious drawbacks as well. It is usually classified as a potentially unwanted and an ad-supported software. It can enter your system without your notice and start inserting various commercials into your web browsers. You should not tolerate the inconveniences that the program causes. We advise the you delete NowUSeeIt Player from your PC right away. How does NowUSeeIt Player work? NowUSeeIt Player is practically identical to Playthru Player. Although it does provide certain useful features, it also disrupts your online surfing by flooding your browsers with advertising content. The adware is compatible with all major browsers, so you will not be able to avoid its ads. These ads will appear in the form of banners, coupons, pop-ups, hyperlinks, and so on. No matter which page you open, you will see commercial data on it. Keep in mind that not all adverts are reliable. Some of them are completely fake and they may lead you to malicious websites. Needless to say, this could result in serious consequences including infecting your PC with harmful programs, wasting your money, and so on. That is why we recommend that you terminate NowUSeeIt Player without hesitation. It is possible to download the application from its official page, however, you should know that it also travels in free software bundles. If you did not download the software on purpose, that is most likely how it ended in your system. The bundling method is often used by ad-supported apps, because that is the easiest way for them to get installed without the computer user’s notice. You should be more attentive when installing freeware, if you do not want to add more unwanted programs to your PC. Next time you deal with free software, install it in the Advanced mode and decline all optional offers that you see. As for now, you should focus on NowUSeeIt Player removal. How to remove NowUSeeIt Player? 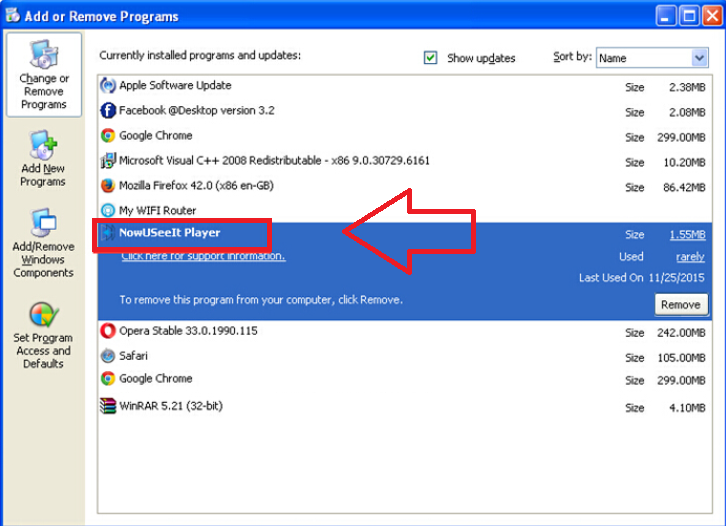 You can eliminate NowUSeeIt Player from your computer manually or automatically. If you choose to go with the first removal option, you will have to uninstall NowUSeeIt Player from your PC and delete it from your browser extensions. If you decide to erase NowUSeeIt Player automatically, you will have to download and install the anti-malware tool from our page. It will scan your PC, detect all of its issues, and remove NowUSeeIt Player along with them. The security software will also ensure your computer’s safety in the future by providing it with real-time online protection and other useful features.